Stephen Hagen, 20, host of Discover Reality, lived in Berwick, Maine for the first 15 years of his life. After spending a year in Germany, a year in Newton, MA and a year in Medford, MA he came to live on Maine again, moving to South Portland. 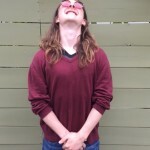 He's had an interest in Music since birth, singing with his family from young age and participating in vocal and instrumental ensembles all throughout school. In 2013 he created a playlist on Spotify called Discover Reality in which he would begin to assemble some of the best recent music he could find. Over three years later he began a Radioshow under the same name. He plays music from all types of genres, but they all belong under the Discover Reality Umbrella. His cohost DJ Citrus, aka Christopher McElaney, is featured on over half of the shows.